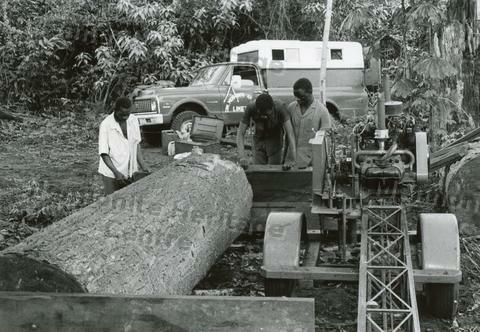 This is a photo of three men using a mobile saw, at Tshikapa, to cut a log. This is inexpensive and efficient for developing countries. Horizontal and vertical blades move on a frame while the log remains stationary. The saw is powered by a VW engine and pulled to the location by the pick-up truck.